Built in thermal overload protection for safety. 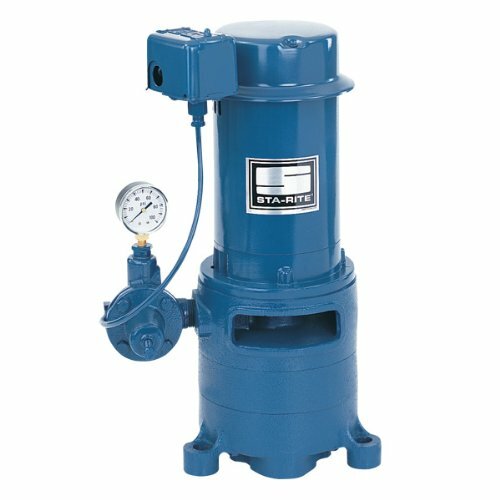 Rugged cast iron pump body for durability. Tough thermoplastic impeller. Glass filled thermoplastic diffuser. Pre-mounted, fully adjustable pressure switch. For shallow well applications up to 25-foot depth. 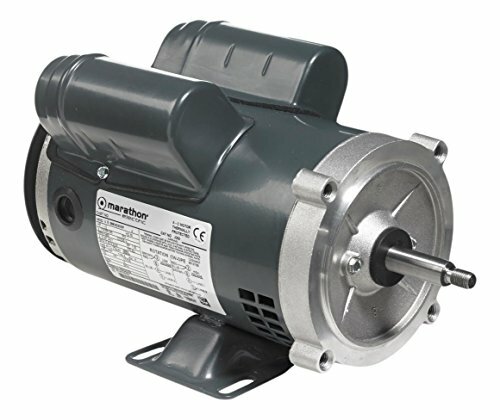 1/2 HP dual voltage motor, 115/230v. Ideal for the Supply of fresh water to rural homes, farms, and cabins that have 4 inch and greater diameter drilled wells to depths of 250'. Vertical Multi-Stage Deep Well Jet, Cast Iron, 2 HPMS Design Series deep well jet pumps feature over-the-well "bolt-on" capability with a special casing adapter for 2" and 3" single pipe installations, and adapter flanges for adapting all double pipe installations.KEY FEATURESQuality Construction - Precision-machined, close-grained cast iron pump body and base are specially treated to resist corrosion.Automatic Pressure Regulator - Faster-acting and quieter, design eliminates "hunting" for correct drive pressure. New improved stem and guide are precisely molded to assure efficient, trouble-free performance on all deep wells.Motor Windings - Superior insulation materials protect against excessive moisture and contaminants to ensure prolonged motor life.Dustproof Cover - All electrical components are protected from dirt, dust and insects by a dustproof canopy. Ventilating air cannot contaminate vital switching components. This eliminates the most common cause of motor failure. 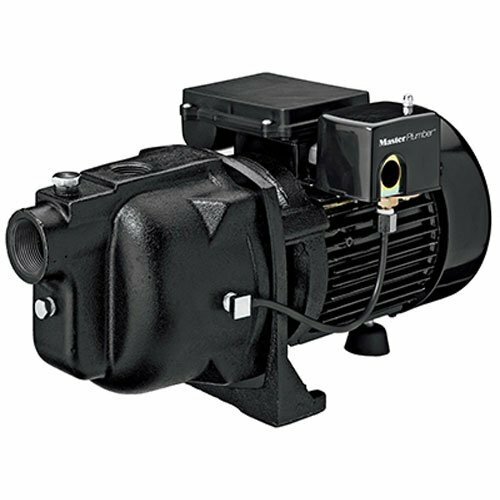 This Marathon 56B34D5341 jet pump capacitor start/capacitor run motor is single phase with one-speed operation. It runs at 2 hp, with a maximum speed of 3600 rpm. It operates at 115/208-230 VAC, 18.2/9.8-9.1 Amp. 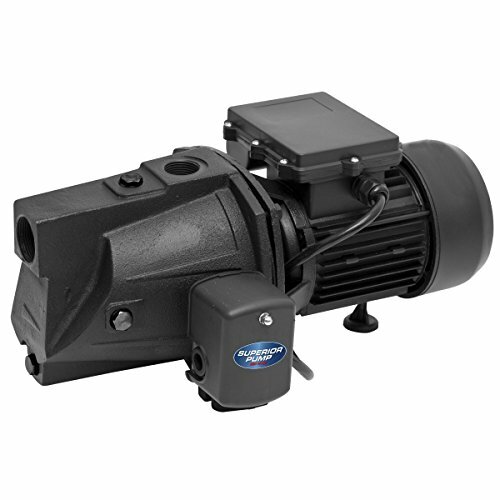 The motor has a 56J frame with open drip proof (ODP) enclosure, C-face with base mounting, and ball bearing system. Weight is 33 pounds. 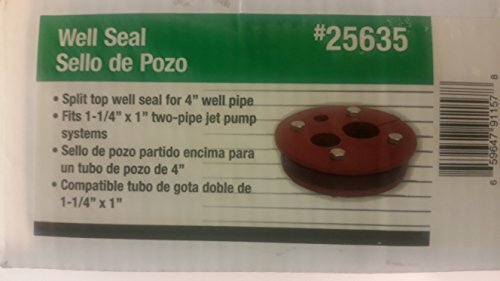 1/2 HP cast iron shallow well jet pump conventional tank system (includes SWS50). Assembled in the US with foreign and domestic parts. 3/4 in. NPT discharge with 1 1/4 in. suction. Dual voltage (120V/240V) high efficiency square flange motor (factory set for 240V). Max flow rate is 420 GPH at 0 ft. (50 PSI). Pressure switch is pre-set at 30-50 PSI for automatic operation. 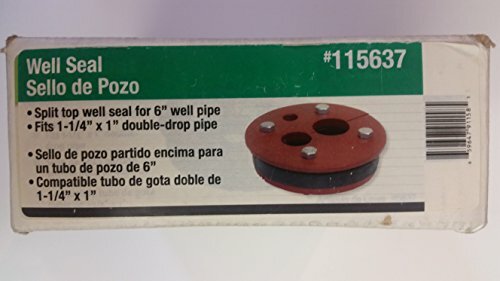 Durable cast iron volute with dedicated priming port for volute filling. For wells 0 ft. - 25 ft. in depth. 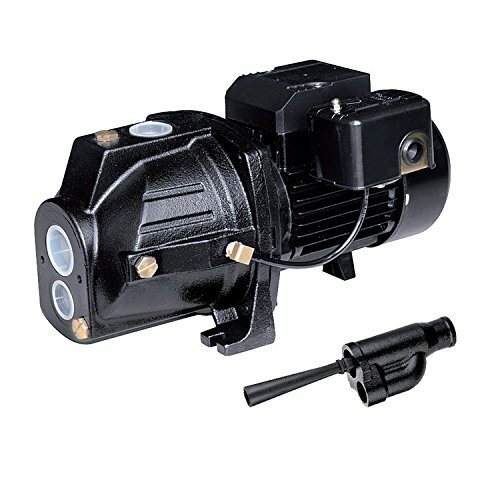 Master plumber, 1/2 hp, 115V, shallow well jet pump, cast iron tefc, 30-50 pressure switch, water depths to 25', reliable performance at 25' depth to water or less, maximum pressures of 63 psi, maximum pumping capacities to 5.1 gpm pump, housing is constructed of heavy duty cast iron & is ready to install, fan cooled, completely enclosed motor, 1-1/4 inch suction port & 1 inch discharge port. 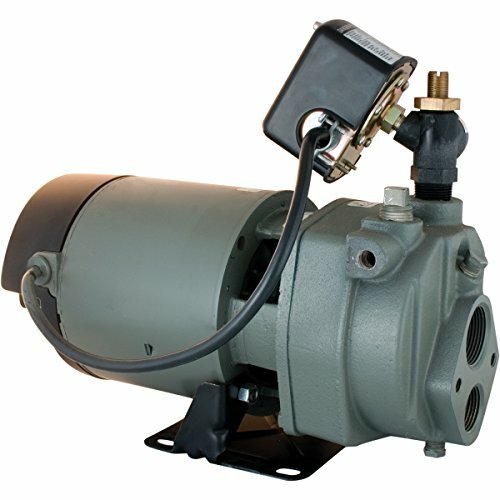 1 hp, deep well jet pump, cast iron, convertible, nema j adaptable uni-frame motor, features includes square-d pressure switch, thermal overload protects against over heating, 0' at 40 psi = 1488 gph, 5' at 40 psi = 1395 gph, 15' at 40 psi = 1089 gph, 25' at 40 psi = 690 gph, 60' at 40 psi = 549 gph, 90' at 40 psi = 306 gph, 110' at 40 psi = 246 gph, ejector purchased separately. An introductory level video to jet pump function and operation. 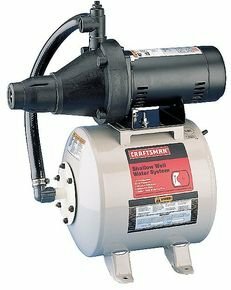 Compare prices on 1 2 Jet Pump at ShoppinGent.com – use promo codes and coupons for best offers and deals. Start smart buying with ShoppinGent.com right now and choose your golden price on every purchase.